Ok so I’m about to break my New Year’s resolution #1 by posting two Sweet Tooth posts so close together, but it’s for a good cause and comes with a great giveaway! I’m excused, right? You see, I’ve decided to make scones because I got my hands on this very special jam… A jam that actually gives back to a very special cause: finding cure for cancer. Now, imagine a jam that’s full of gorgeous, ripe strawberry aromas, lightly smoky, with a consistency of just-about-set Turkish delight and a hint of luxurious vanilla bean. An instant taste sensation that feels loving like a grandmother’s hug, and homely like a warm blanket on a chilly winter’s night. Meet Love Gastronomè‘s strawberry and vanilla bean jam. But that’s not all that makes this jam special. $5 from every jar sold is donated to CanToo in support of Cure Cancer Australia Foundation. Since I have made my own pledge to raise $1,250 for CanToo by May while training for the SMH half marathon, I’m excited that I can help raise the much needed funds while spreading, excuse the pun, a fellow foodie’s passion for yummy food. Best of all, you too can contribute to my fundraising tally by munching on some serious gourmet goodness; simply mention Wholesome Cook when you order your products online. Plus, if you like a giveaway you will get bonus entries into the goddie jar draw by making a purchase (see details below)! I have to admit that this is the first time ever I’ve made scones, but the jam just called for it and they turned out quite well actually. Every bite was better than the last. The buttery crumbliness of the scones was perfect on the outside while the buns remained airy on the inside. Though I think I left them in the oven a minute too long and they browned a little too much…Oops! Despite this, the double cream meandering through a thick layer of the strawberry and vanilla bean jam, looked as irresistible as it tasted. I sat there and slowly savoured each little bite, knowing that while I was enjoying a moment, I was also supporting a worthy cause. Giveaway – is now closed. Follow me on Facebook or Twitter – personally, I recommend Twitter for daily doses of coming ups and cooking nows. Retweet this post or share it with your friends on Facebook. Comment on at least 3 of my posts (past or current) – the more you comment the more entries you get. Bonus 5 entries: purchase at least 1 jar of goodies from LoveGastronomè before 15 April 2011 and mention Wholesome Cook at checkout. Preheat oven to 220°C (425F, gas mark 7). Combine the self-raising flour and caster sugar in a medium bowl. Rub in the butter until the mixture resembles fine breadcrumbs. To help incorporate some air into the mixture, keep the palms of your hands face-up as you lift the flour to rub in the butter. Add milk. Mix together using a cutting motion until evenly incorporated and the mixture begins to hold together. Do not over mix. The dough should be soft but not sticky. If it is a little dry, simply add a little more milk. Then bring dough together with your hands. Turn the dough onto a lightly floured surface and knead gently about 4-5 times. It is important that you knead gently and don’t handle the dough too much, otherwise scones will be tough. Flatten the dough with the palm of your hand to 2cm thick and cut out 4-6 rounds using a 5cm pastry cutter or a champagne glass dipped in extra flour. Do not twist the cutter as this will cause the scones to rise unevenly. You can re-roll any scraps and cut more scones; however, these will be slightly less tender than the scones cut from the original dough. Place scones on a baking tray about 1cm apart. Sprinkle with some extra flour. Bake in for 10-12 minutes or until just golden. Remove the scones from the oven and immediately wrap them in a cleantea towel. Wrapping the scones will keep them warm and will give them a softer crust. Serve warm with jam and double cream. Those scones look awesome. Not bad for a first attempt. Thanks!!! It’s not tge last time I’ve made some for sure! OMG strawberry and vanilla bean jam sounds absolutely stunning! And I can imagine that they will be a real treat with these scones! 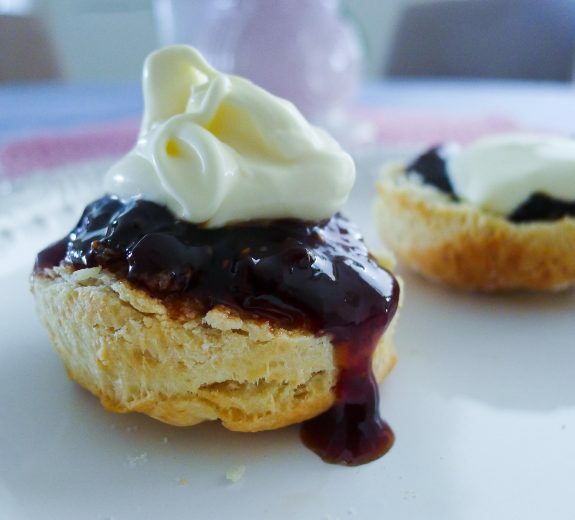 I’m craving for an afternoon tea now with scones, jam and cream – the simple pleasures! Good work that you guys are doing! Seriously! I love what Simone is doing with her foodie passion!